Apoptosis is a physiological process in which cell death is brought about through a regulated sequence of events. It allows for the programmed removal of specific cells, without harming nearby cells. Defects of this process play an important role in a variety of diseases. This article shall consider the process of apoptosis, its regulation and some clinical conditions in which it plays a role. Apoptosis can be initiated by one of two separate pathways; the intrinsic or extrinsic pathway. Both of these pathways end with a final common effector pathway, known as the execution phase. The intrinsic pathway is modulated by two groups of molecules, Bcl-2 and Bax. Activation of Bax leads to the formation of Bax-Bax dimers, which in turn enhances the action of a variety of apoptotic stimuli – increasing a cell’s susceptibility to apoptosis. The Bcl-2 family consists of both pro- and anti-apoptotic members, and it is the balance between these that determines how susceptible a cell may be to apoptosis. The extrinsic pathway triggers apoptosis in response to external stimuli, namely by ligand binding at ‘death’ receptors on the cell surface. These receptors are typically members of the Tumour Necrosis Factor Receptor (TNFR) gene family, such as TNFR1 or FAS. Binding at these receptors leads to receptor molecules grouping up on the cell surface to initiate downstream caspase activation. Fig 1 – Diagram showing the intrinsic and extrinsic pathways of apoptosis. 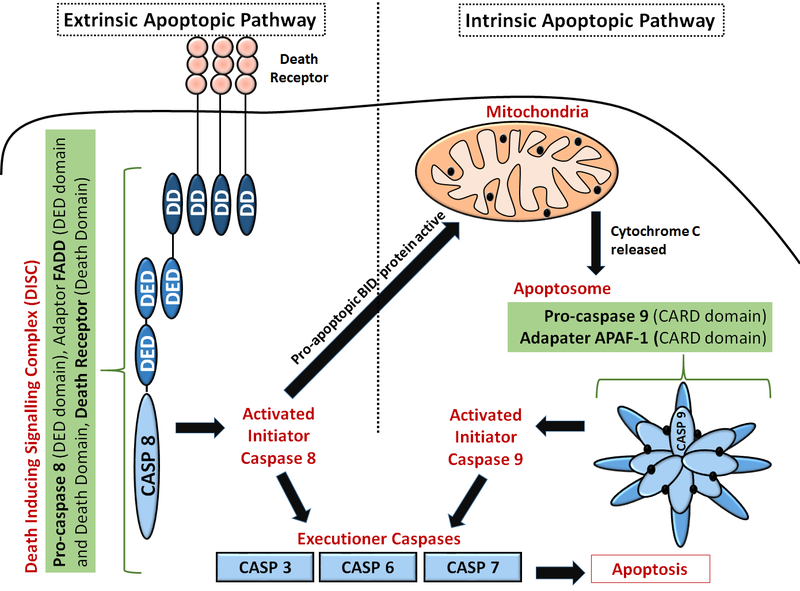 The initiation of apoptosis by either pathway results in a cascade activation of caspases. These are specialised proteases which normally reside as inactive precursors within the cell. Initiation of apoptosis first activates initiator caspases, such as caspase 8, the role of which is to cleave other pro-caspases into active “executioner” caspases. These executioner caspases then cause degradation of a variety of cellular structures, such as the cytoskeleton and nucleus. For example, caspase 3 activates DNAse – leading to fragmentation of DNA. These processes lead to a variety of morphological changes within the cell, such as nuclear shrinkage (pyknosis) and fragmentation (karyorrhexis). Alongside this the cell itself shrinks, but importantly, retains an intact plasma membrane. The dead cells are either immediately phagocytosed by neighbouring cells or break down into smaller, membrane bound vesicles, known as apoptotic bodies – which are eventually phagocytosed. If apoptosis fails in these sites, or in another site where it is essential to development, then a variety of conditions can develop, including syndactyly (webbed fingers), cleft palate or spina bifida. Fig 2 – Development of the urinary system. 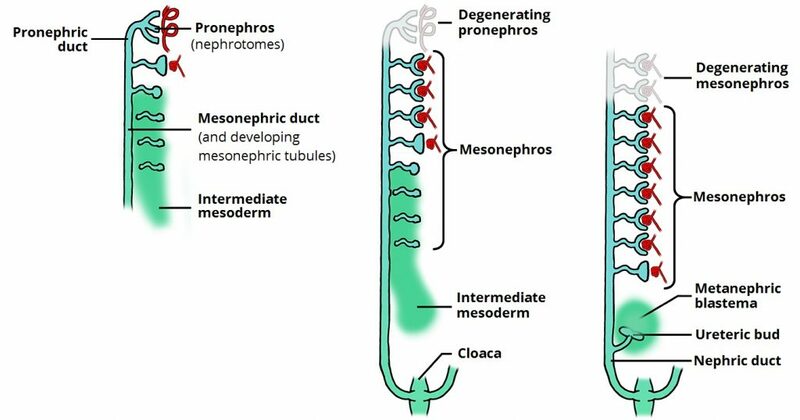 Apoptosis has a role in cell death leading to removal of vestigial remnants from earlier in development, such as the pronephros. There are a variety of factors responsible for regulating apoptosis, both intracellular and extracellular. External signals can include growth factors or specific signals from other cells, whereas internal factors can include DNA damage or failure of cell division. Syndactyly is the most common congenital malformation of the limbs and occurs in 1 in 3000 live births. 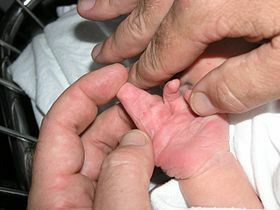 It is a condition in which two or more digits remain fused together after birth, due to a failure of apoptosis. Syndactyly of the most medial and lateral digits is treated at an early age, to avoid curving of the digits towards each other with growth. Which of the following would NOT activate the intrinsic apoptosis pathway? Which enzymes play a key role in the execution of apoptosis? Which of the following would be expected to induce apoptosis? What is a simple syndactyly?